Svay Sareth, Prendre Les Mesures, 2015. Courtesy of Svay Sareth and Biennale Sydney. This approach to life is evident from looking at his house, which is a Tuk Tuk ride away from Siem Reap. The place has been entirely designed by himself, from the floor plan to the furniture. Dressed in an unassumingly plain, clean shirt and black pants, he proves that being an artist is an attitude rather the attire you wear. What counts is the creative élan that you show, whether that be high or low art, or any other activity for that matter. It is natural for someone who grew up in the refugee camp Site II on the Thai-Cambodia border while fleeing the Khmer Rouge with his family, to have an anti-elitist attitude to art. Just like the inherent tension of looking for more, exploring more, learning more. With eight other young Cambodians, he began taking drawing classes with Veronique Decrop, a French Humanitarian worker at the refugee camp. He felt he had finally found an outlet for expression. Today a big part of his art practice is based on this re-telling of his experience with a newfound awareness, connecting the personal to the larger socio-political realm. 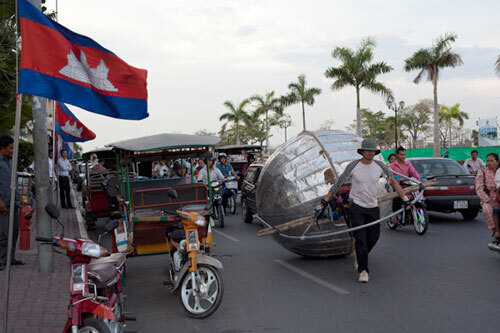 This emerges clearly in his 2011 performance Mon Boulet – meaning my burden – where hauled a two-meter-wide, 80-kilogram silver sphere from his Siem Reap home to Phnom Penh. Along the six-day journey, Svay ate only food offered to him by strangers and slept on a blue tarpaulin—the kind used as shelter by refugees worldwide. To the artist sharing his story means also processing it. At the recent 21st Biennale of Sydney he presented one video work that exemplifies that critical outlook on the consequences of political decisions taken over time. 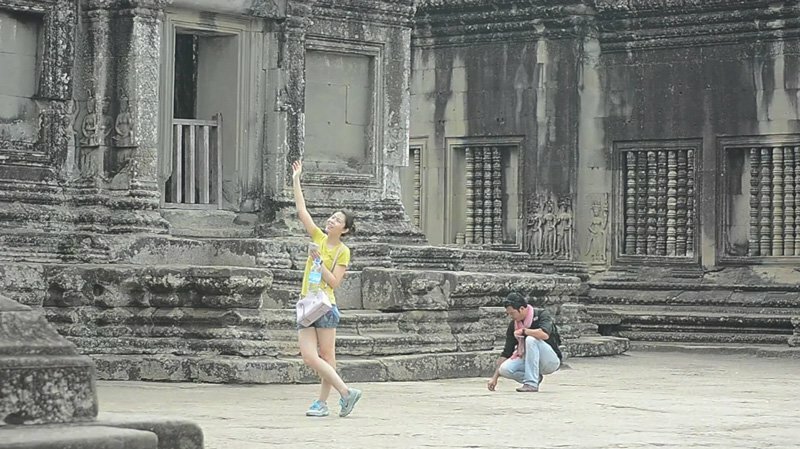 In Prendre les Mesures (2015), the artist performs at the famous Angkor Wat temple complex. Using a large needle, a tool traditionally used to mend damaged rice sacks, Svay measured the length of the causeway at the entrance to the temple. The title of the work, which means ‘to take measures’ in French, is a double entendre. The literal interpretation is ‘to measure something’, but it can also be understood as ‘to take necessary measures to address a situation’. In 1993 a big shift happened for the artist. The French volunteer Veronique Decrop came back to Cambodia to find the kids from her drawing class so that they could create an art school together. She bought a piece of land in the countryside where the poorest people of the Battambang province lived and created the celebrated art school, Phare Ponleu Selapak. “When the school was finished, we started to teach. We had to figure out how, since we had no experience. At this time, I was also developing my own art practice, as well as organising exhibitions as a curator. But one day, I felt I’d arrived at the limit of my knowledge.” Thanks to his contact with Veronique, Sareth moved to France in 2002. At the art school in France, his professors were not particularly impressed by his paintings, which were quite traditional. One day, a professor he was very close to took him aside and told him: “Sareth, I learned about your story. I can’t teach you about the experience of life, but what I can tell you is that you must put more of yourself into your art. You must do something different.” This observation threw Sareth into despair. He couldn’t sleep for a week and he eventually got sick. But he refused to go to the doctor and take the same medicine as everybody else as he felt it would “normalise” him. This is a strong metaphor for his art practice, as he had to dig into his disease to understand it and come out through the other side. 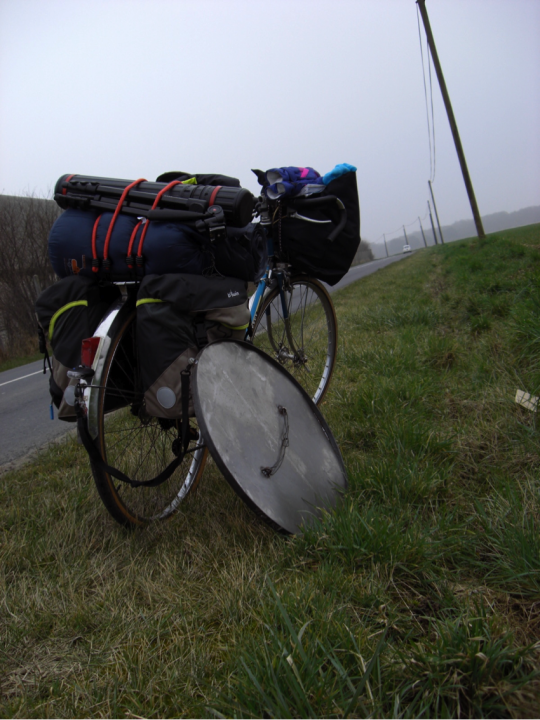 After that realisation, he created his first performance called Bouclier (Shield) in which he carried around a metal shield on a bicycle from Normandy to Paris. “I didn’t conceive it as a performance in the beginning. I just did something I’d never done before. You can call it an installation or a performance, you can even hang it up as a painting. It depends on how do you want to tell the story. It’s my own story and it follows me everywhere.” That year he also decided to burn his paintings and carry the ashes around with him, and started doing a number of impromptu performances and generally experimenting. These included Tuesday, where he built a boat from scratch and tried to sail it, marking the moment that he felt ready to go back to Cambodia. 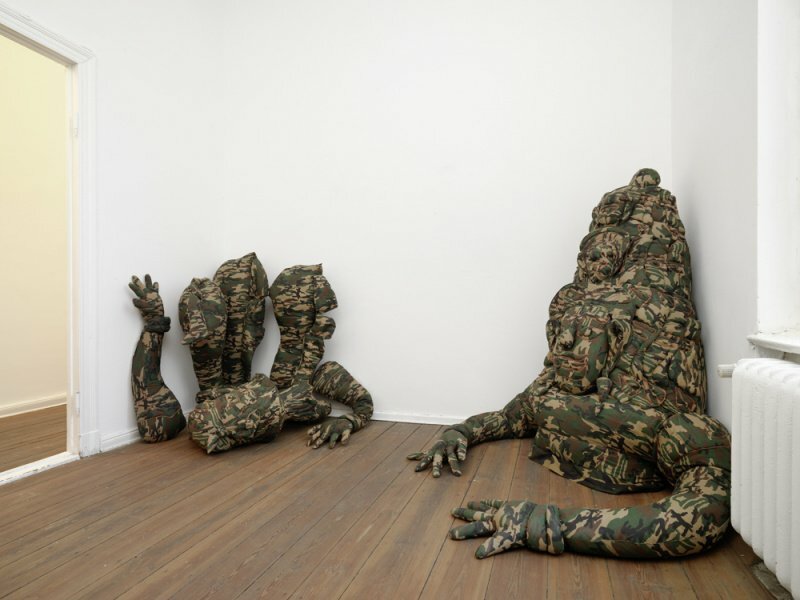 Svay Sareth’s works in sculpture, installation and durational performance are made using materials and processes intentionally associated with war – metals, uniforms, camouflage and actions requiring great endurance. While his critical and cathartic practice is rooted in an autobiography of war and resistance, he refuses both historical particularity and voyeurism on violence. Rather, his works traverse both present and historical moments, drawing on processes of survival and adventure, and ideas of power and futility. More recently, Svay confronts the idea that “the present is also a dangerous time” through the appropriation and dramatization of public monuments that hint at contentious political histories. studies in France, earning the Diplôme National Supérieur d’Études des Arts Plastiques / MFA in 2009, after which he returned to Siem Reap to live and work.